It might be a great sci-fi movie, but it's not a very faithful adaptation. The biggest and most popular new sci-fi movie of the moment is easily Annihilation. The director of Ex Machina, Alex Garland, has returned with a visually stunning and creeptastic speculative hit. 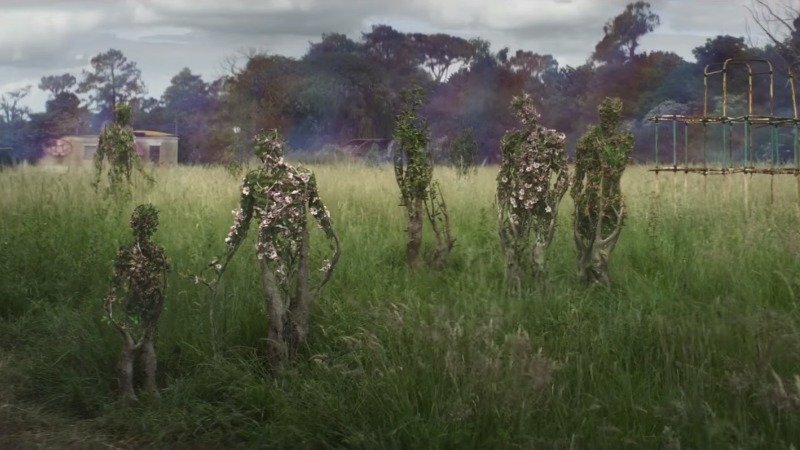 Annihilation is also an adaptation of the very popular book of the same name, the first novella in Jeff VanderMeer’s popular series, The Southern Reach Trilogy. But, is the movie anything like the book? Short answer: it’s pretty different. Much of what makes a thrilling book is different than what makes a successfully scary film. Still, for fans of the books, many of the changes and omissions from the source material are shocking. Here are five big differences between VanderMeer’s Annihilation and the new film. In the book, the unnamed biologist narrator first gets hip to the idea of intelligent creatures living in “Area X” when she observes living fungus writing English words on a wall. These phrases are creepy as hell, and have a maddening quality that will remind horror readers and True Detective fans of Robert W. Chambers’s The King in Yellow. The film doesn’t have any of this. One of the scariest and most effective narrative devices in Annihilation is the fact that the expedition team members are hypnotized to do things against their will by a psychologist. In the book, the narrator’s exposure to the spores seems to render her immune to this, but she still fakes being hypnotized anyway to try and figure out what is going on. The psychological warfare this wages on the reader is nowhere in the movie. In the film, you get the sense that few have made it back alive from these intense expeditions. But, in the book, it’s actually a little scarier: most people, including the narrator’s husband, did come back from Area X. But, they act like husks of their former selves, utterly devoid of regular human behavior. This is fairly faithful in the film, but in the book, you get a real sense of how common this was from other expeditions. It’s also made clear that we’re supposed to understand that there were 12 prior expeditions in the book, even though that turns out to be a lie. In the film, we really don’t know how many expeditions people believe there were before. The book opens with the discovery of a strange structure which the biologist narrator calls “the tower,” even though it seems like a tunnel that extends into the ground rather than upward into the sky. This thing turns out to be kind of organic. It’s not really a part of the movie. In the film, the entire movie is told in flashback. Natalie Portman’s character Lena is in quarantine. In the book, you’re meant to think you are reading an actual journal written by the narrator. Obviously, for a movie, the visual of having the narrator in quarantine make sense. But, it does change the tension considerably. At one point in the book, the narrator finds other journals hidden in a lighthouse. Ominously, she suggests the reader might be reading her journal right now, which, implies, creepily that she doesn’t know if she’ll live or die. The movie makes the quarantine. scary, but it might not have the same disturbing emotional impact of believing you might be reading the journals of a dead person. Annihilation is out in wide release now.